Throwback Thursday Collections Spotlight: Don Lufkin’s Saddle. Donated to the Tread of Pioneers Museum in 1998 by Donald Lufkin. According to the Lufkin family, this saddle was only the second saddle Don ever used – the first being his father’s old saddle. The Lufkin family understood the value and need for quality horses, saddles and harnesses. Lufkin likely purchased the saddle from Harwig’s saddlery in Steamboat Springs. 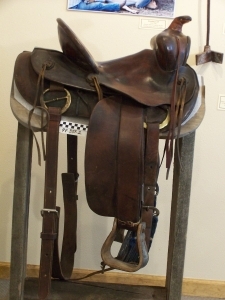 The saddle was made by the Powder River Co. in Denver. Lufkin was a noted local rancher, investor, philanthropist and community donor who grew up on a ranch east of Steamboat Springs. He attended the one-room Mesa schoolhouse and Steamboat Springs High School, and served two years in the Navy during World War II. In 1950, Lufkin purchased his family ranch from his parents and spent the next 30 years running a Grade A dairy and beef cattle operation. After the death of his wife Eleanor in 1977, Lufkin turned over the ranch to his daughter and continued his real estate business. Lufkin passed away in 2012.